Read about Baykeeper's 30 years of defending the Bay, the scientists behind our work, fighting coal pollution, and more. Read about Baykeeper's work to protect wetlands, prepare for sea level rise, and stop industrial pollution in San Francisco Bay. Read about Baykeeper's new aerial pollution patrols, how we're protecting Bay sturgeon from selenium, how you can stop microbead pollution, and announcing the 2018 Bay Parade. Read about the cleanup of the toxic Ghost Fleet of Suisun Bay, and how we're fighting a new refinery expansion that would increase the risk of a catastrophic oil spill on the Bay. And, get an update about what the Baykeeper boat patrol and pollution investigation team have been up to. 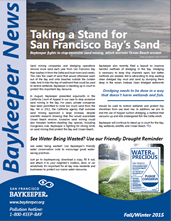 Read about Baykeeper’s work to protect San Francisco Bay from threats at all levels, the latest on our Bay-Safe Industry wins, how California can make smarter decisions about water, and announcing the 2017 Bay Parade. 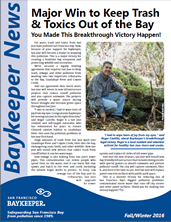 Read about Baykeeper’s breakthrough victory to keep trash and toxics out of San Francisco Bay, and how Baykeeper supporters are making the Bay safer from coal pollution. Get news about 18 industrial facilities that are no longer polluting the Bay with toxic runoff. And find out how Baykeeper's work to stop pollution has made the water healthier for whales that arrived in the Bay over the summer. 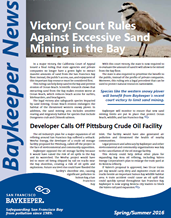 Read about Baykeeper’s court victory to stop excessive sand mining in San Francisco Bay and how this victory can benefit coastal beaches and Bay wildlife. Learn about how Baykeeper is standing up against the danger of coal pollution in the Bay. Get news of our latest victories to protect the Bay from toxic industrial contamination. And see what future sea level rise could mean for communities along the Bay shoreline. Read about Baykeeper's work to stop harmful dredging methods that make San Francisco Bay more vulnerable to sea level rise. Get the story on our legal case against excessive sand mining in the Bay, which contributes to erosion at San Francisco's Ocean Beach. And find out what we do when an industrial facility agrees to implement pollution controls to protect the Bay—but the controls don’t work. Read about a new tool to protect San Francisco Bay from sea level rise, and the remote-controlled boat used to make the tool. 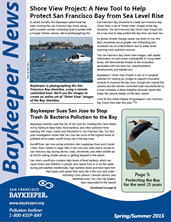 Find out about Baykeeper's lawsuit to stop San Jose's trash and bacteria pollution of the Bay. Learn about our vision for protecting the Bay for the next 25 years. And get tips on how you can help keep plastics and drug pollution out of the Bay. Plus, meet both species of pelican that call the Bay home. Read about a new law that provides expanded protection from oil spills for San Francisco Bay's entire watershed. 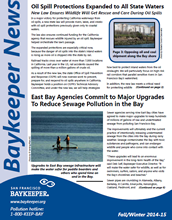 Learn about a Baykeeper breakthrough to reduce sewage pollution in the Bay. Find out about our new victories to keep industrial pollution out of the Bay, and key victories over Baykeeper's proud 25-year history. And get the story on one of the Bay's most majestic birds, the great blue heron. Read about Baykeeper opposing the oil industry's plans to expand refining and export of oil on the Bay's shore, which would raise the risk of oil spills in the Bay. Get the story on Baykeeper's founding 25 years ago and of a crucial moment in our history, when Bay polluters went to jail. Plus, find out about the Dungeness crab's amazing journey, walking along the Bay bottom all the way from San Pablo Bay and out the Golden Gate. 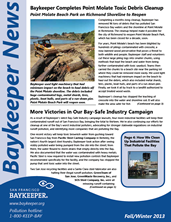 Read about Baykeeper finishing our cleanup of toxic debris from Point Molate Beach in Richmond. Ever wonder how we compel industrial facilities to stop allowing pollutants from their site to run into the Bay? We let you in on how we do it, step by step. Plus, learn about sewer agencies that are doing their part to keep spills of raw and undertreated sewage out of the Bay—and some that are falling down on the job. And meet a beautiful water bird that arrives here each autumn, the Western Grebe. Read about Baykeeper winning new oil spill protection for San Francisco Bay, the progress we're making toward a sewage-free Bay in our Sick of Sewage campaign, and new victories to protect the Bay from industrial pollution. Plus, learn why fracking for oil menaces the Bay and meet a year-round Bay resident, the harbor seal. 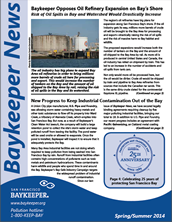 Read about Baykeeper's new progress cleaning up Bay industrial pollution, the Cosco Busan oil spill five years later, and tips to make your home and garden Bay-friendly. Learn about one of the Bay's oddball creatures and see photos from the Swim for the Bay! Read about Baykeeper's new Bay-Safe Industry campaign to rein in toxic industrial storm water in the Bay, recent progress toward a sewage-free Bay, a new California bill to protect wildlife from oil spills, and the 40th anniversary of the Clean Water Act. Learn about Baykeeper's boat patrols and grey whales in the Bay! Read about Baykeeper's new initiative to control toxic industrial runoff into the Bay, recent legislative victories and threats to the Clean Water Act. We also provide an update on our Sick of Sewage Campaign and the cleanup of Suisun Bay's Ghost Fleet. Learn ten ways you can stay pesticide-free to help protect our waterways from contamination, and read about the threatened California red-legged frog. Read about Baykeeper's latest work to reduce sewage spills. We also wrote about the upcoming America's Cup, our advocacy for sea level rise protections in the Bay, and our pilot program to study micro-plastics. You can also learn about sharks in the Bay, the salt marsh harvest mouse, and how you can help keep everyday chemicals out of the Bay. Read in-depth coverage of our latest victory to clean up sewage spills in the Bay. We also wrote about the ongoing impacts of the BP oil spill in the Gulf and the implications of BP's mismanagement of the crisis. Ever wondered why rainwater is a source of pollution to the Bay? Check out our full-page diagram that explains how storm water becomes a pathway for Bay pollutants like trash, heavy metals and pesticides. 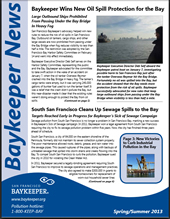 Read about Baykeeper's latest work to protect the Bay, including tracking winter 2010 sewage spills to the Bay and filing twelve lawsuits to reduce sewage spills to the Bay. You can also learn about our work to improve oil spill policies for the Bay and monitor recreational use of the Bay. Read about Baykeeper's latest successes to protect the Bay, including two recent settlements to reduce sewage spills from Burlingame Hills and Hillsborough. You can also learn about our recent victories to control aquatic pesticide spraying and abandoned boats in the Bay, as well as get ten tips for protecting the Bay in your household.